TV show dates:August 17, 2018 — present. Performers include: Abbi Jacobson, Eric André, Nat Faxon, John DiMaggio, Billy West, Maurice LaMarche, Tress MacNeille, David Herman, Matt Berry, Jeny Batten, Rich Fulcher, Noel Fielding, and Lucy Montgomery. From Matt Groening, the Disenchantment TV show is an adult, animated fantasy comedy series. The story unfolds in the medieval kingdom of Dreamland, which has seen better days. It centers on Princess Tiabeanie, i.e. Bean (Jacobson), her elf companion, Elfo (Faxon), and her personal demon, Luci (André). At just age 19, Bean is the hard-drinking daughter of King Zøg (DiMaggio) and the late Queen Dagmar, who died when Bean was just a little girl. Given the patriarchal nature of Dreamland’s government, Bean knows she will never assume the throne. That honor will instead go to her less competent half-brother, Derek (MacNeille). With little future in this crumbling kingdom, Bean longs to explore the wider world and find out where she fits in. When she was about to wed, a mysterious force from far, faraway cursed Bean with her own personal demon — Luci. As Bean is Luci’s first assignment, he’s training on the job. He may have been sent by Cloyd (Fulcher) and the Enchantress (Montgomery), who have taken an interest in Bean. Their assistant, Jerry (Herman), seems like a dim bulb, but there’s a lot going on there. An 18-year-old elf from the secret world of Elfwood, Elfo is a cheerful positive fellow and has an impressive knowledge of candy. Still, he’s always felt a bit different from the other elves and like Bean, is in search of something new. After Queen Dagmar died, King Zøg married Queen Oona (MacNeille). An amphibian from the neighboring kingdom of Darkmire, Oona wed Zøg to forge an alliance between their realms. Her 12-year-old son, Derek, is now heir apparent, but while Bean thinks of Oona as a wicked stepmother, there’s more to her than meets the eye. For himself, Derek’s a sweet, trusting kid, and may even have a brain between his ears. He’s always gotten on Bean’s nerves though, but he could yet prove to be her ally, provided he’s not locked away in the tower. King Zøg is prone to bluster. His favorite sentence to impose is dropping people through a trapdoor that leads to the ocean. He has a soft spot for Bean though, and has never forgotten his love for Dagmar. Zøg is attended to by Zip and Zap, his silent cape-bearers. Odval (LaMarche), the Prime Minster of Dreamland, is the king’s closest advisor. He usually serves as Bean’s foil, and has both a superior attitude, and a tragic past. Odval’s friend, Sorcerio (West) the wizard, knows more card tricks than magic. The two have been together for a very long time. After Bean accidentally kills Guysbert (Herman), she is supposed to marry his younger brother, the obnoxious Prince Merkimer (Berry), from nearby Bentwood. Somehow though, he is turned into a pig before the ceremony. Now he has to get by without his looks and money, while he waits for the curse to be broken. Soft-spoken and warm, Stan (Fielding) is the Dreamland’s Executioner and Manager of the Torture Chamber. He’s been tutoring Bean in his trade. His wife, Bunty (Montgomery), is Bean’s lady-in-waiting. She works far too hard and receives too little gratitude for cleaning up after Bean’s messes. Rounding out the kingdom are The Jester (West), who often fails to amuse the king, and winds up getting dropped through the trapdoor; Pendergast (André), the Head Knight of Dreamland, and his junior knights, Turbish (Fulcher) and Mertz (West), who are often more trouble than they’re worth. Finally, there is The Herald (Herman), Dreamland’s main source of information. He strolls the village streets and castle halls calling out the latest breaking news and announces every arrival at the castle. Together, and with the help (and hindrance) of the rest of Dreamland, Bean, Elfo, and Luci form an interesting trio and are in for many adventures. What do you think? 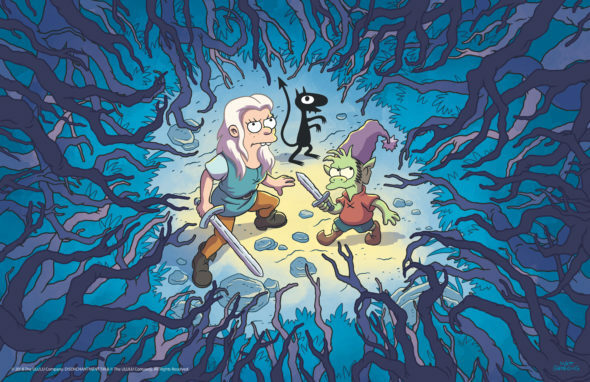 Do you like the Disenchantment TV series? Should this Netflix TV show be cancelled or renewed for another season? More about: Disenchantment, Disenchantment: canceled or renewed?, Disenchantment: ratings, Netflix TV shows: canceled or renewed? Disenchantment: Is the Netflix TV Show Cancelled or Renewed for Season Two?